This Mediterranean Flatbread Pizza will seriously step up your pizza night game. Made with an homemade Muhammara, vegan, gluten free, easy, and incredibly delicious. We all love and crave our Pizza nights. I’m sure you feel the same about this and I’m not alone. And if anyone claims the opposite, I don’t believe it. 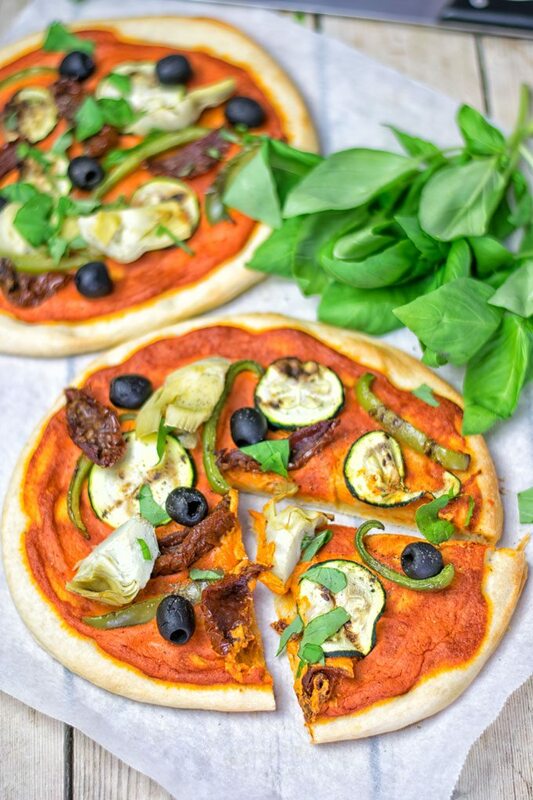 You may know that I have brought you guys already some mouthwatering vegan pizza options. Like my Broccoli Cheese Vegan Pizza, the Tempeh Bacon Kale Pizza, or the Mediterranean Vegan Pizza. You see Mediterranean food is always in my heart, not only in pizzas. Well, there are of course even more (hint: search bar!) to get excited about. There are plenty of other amazing options for you. But now is the time to get your pizza fixing high and get hungry for something new. Just looking at this Mediterranean Flatbread Pizza tells you what you can expect. It’s creamy thanks to homemade muhammara, fresh with roasted veggies, flavorful, Mediterranean inspired, mouthwatering, shareable, made for potlucks, get togethers, summery, light, and colorful. Let’s not goof around but get things going in the kitchen. First, spread some Muhammara on the flatbread. That’s all it takes to prepare for your toppings. Think of bell pepper, olives, zucchini, sun dried tomatoes, and artichokes. Season with salt and pepper. Next bake the pizza on a baking sheet with parchment paper, for around 15 minutes at 410°F. Done and ready to enjoy. This pizza makes an incredibly easy dairy free appetizer as well, so it’s not just only lunch or dinner. Speaking of summertime: I can imagine you can make this even on a grill, what do you think? Can you already smell and taste these amazing flavors fresh from the grill? I do myself and couldn’t resist. One word to this homemade Muhammara. You will get a big batch when making this, so you will have some leftovers. But the great thing is you can put the rest into pasta dishes, on sandwiches, wraps, salads, burgers. So many awesome options for you. Or just eat it plain with some veggie sticks or chips. We’re all totally into that summer mode. It’s warm and we’re excited to go outside. To see and feel the beauty of summer. So perfect. Also what comes with hot summer days? Yes, we’re in the mood for long summer and chill out nights. Maybe at the beach if you are lucky enough to live close to one. Or potlucks, get togethers in the garden, BBQs and so much more. Serve this Mediterranean Flatbread Pizza and you will be the star of the show. I made this several times for friends. There were also a lot of non vegan friends and no one could believe it’s vegan, gluten free, made with just 6 ingredients. Make amazing taste fit into a plant based lifestyle. Yes, you will see the wow faces. I mean who doesn’t love pizza? See no one would resist and say no to this. Plus it’s even better because its’ so easy. Can you already imagine sitting on one of those beautiful beaches. Of course with some pizza *wink* and maybe a cocktail or a nice glass of wine. Could it get any better? I’m not sure. But for real, friends. Who doesn’t dream of a beach. It’s so relaxing, calming and provides always a good time. There are so many beaches out there. Waves and beach life in California, anyone? Think about the beautiful beaches of Mexico, or the Mediterranean islands of Spain. If you need some more inspirations where to go, check this out: “21 Best Beaches in the World“. If you give this a try, be prepared for long chill out nights, amazing get togethers, with lots of fun and amazing company. Bring it on, tag me on Instagram and Facebook and show me all your summer plans. 1 batch Muhammara — leave out the chia seeds, add 4 more garlic cloves! Spread some Muhammara on the flatbread. Add bell pepper, olives, zucchini, sun dried tomatoes, and artichokes. Season with salt and pepper.